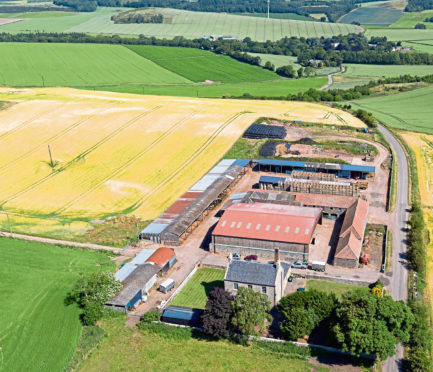 A 425-acre mixed arable and livestock farm has gone on the market in Fife. Wester Forret Farm, which is three miles from Cupar, carries a price tag of offers over £3 million. The farm extends to 425.53 acres and the sale includes a B-Listed five-bedroom farmhouse, a semi-detached cottage and a range of modern and traditional farm buildings. “Wester Forret offers an excellent opportunity to acquire a genuine mixed holding within a desirable part of north-east Fife,” said Duncan Barrie, a partner at selling agent Galbraith. “The majority of the productive arable land is situated to the west of the holding largely classified as grade 3.1 and 3.2 with some grade 2 land, currently down to a mix of cereals, with some fields growing seed potatoes and broccoli. He said the current owners had carried out a programme of ditching and drainage work in recent years to ensure the land could be used to its maximum potential. “All the fields are accessible, of a good size and offer easy access to modern machinery,” Mr Barrie added. He said the farmhouse, which also boasts two reception rooms, is set within a peaceful and private walled garden. In addition, the semi- detached two-bedroom farm cottage, which is currently let on a residential tenancy basis, could be used as a worker’s cottage or as additional family accommodation. Mr Barrie said: “The property is surrounded by picturesque scenery and within an area known for its fertile farmland, capable of producing high yields of an extensive range of crops.